When I first heard about a new comic publisher emerging on the scene, "Cave Pictures Publishing," they sounded interesting--comic-books with a spiritual angle (not focusing on a particular religion, per-se) telling assorted yarns. I wrote them an email asking to be on a press-list or such in order to stay updated but never heard back. I didn't take it personally as plenty of publishers get random emails from people claiming to have websites and sorting through it all is probably a pain (and spam filters can be overeager and block my emails to companies as well). However, in an interesting twist one P.R. 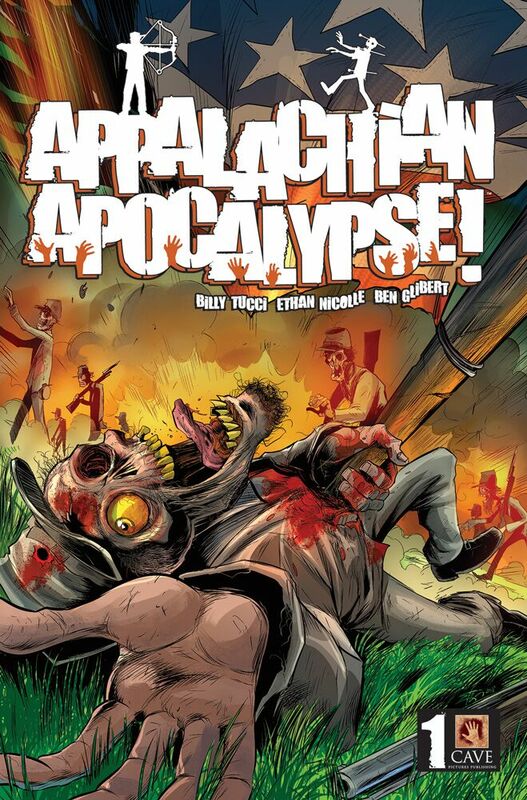 company that at times sends folk emails about various comic projects sent me a message about Cave Pictures Publishing and their debut comic (the one I was most excited to read), "Appalachian Apocalypse." Set in West Virginia (where I once lived) it involves a mixture of American and Religious history colliding to result in (what else?) zombies. Written by creator Billy Tucci (of, "Shi," fame) and illustrated by Ethan Nicolle ("Axe Cop," illustrator), "Appalachian Apocalypse," opens in 1864 and follows a bloodthirsty Confederate general (who we later learn had a fondness for religious artifacts) summoning the undead in a last-ditch attempt to turn the tide of the Civil War. He fails and end-up buried in a cave (along with all the secrets) until a modern-times scientist uncovers it. From this point the comic gets a little slower, laying-out the present-day characters and the plot of how Moses' staff (of all things) ended up stolen and eventually smuggled to America--and it clearly is going to cause more undead-stuff. It is interesting stuff, but I honestly was hoping for more zombie-filled goodness like in the comic's opening. Nicolle's artwork hits the right mixture of silly-and-cartoonish without being too over-the-top and Tucci does a good job setting stuff up, but this first issue is a lot of set-up. I still enjoyed it with the mixture of modern-meets-ancient, and zombies in general are pretty fun. 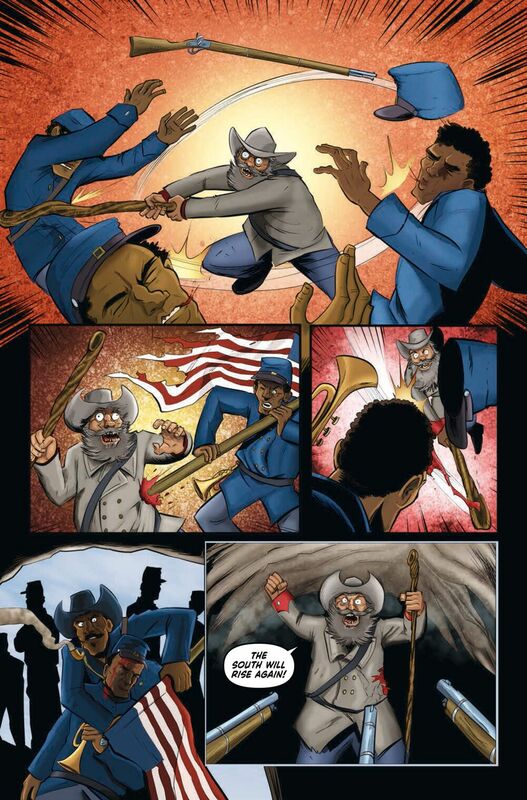 I see potential for this series to utilize its mixture of wacky elements and interesting historical fiction to continue getting even more entertaining. For now, it's a solid 3 out of 5 stars. 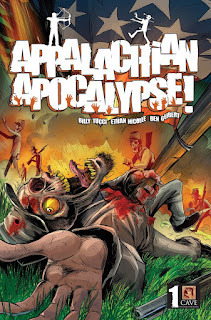 "Appalachian Apocalypse," #1 will be in comics stores this Wednesday, January 16th and I encourage you to tell your comic shop to grab you a copy or order one if they don't have any in stock. Note: A digital copy was provided by a P.R. company that put me on its list for comics and sends me stuff for the purposes of review.